2013 saw the launch of Naim’s DAC-V1/NAP 100 DAC/preamplifier/power amplifier combination. The £1,250 DAC-V1 was arguably the more interesting of the two half-size boxes, as well as being the Salisbury company’s second ever digital converter. It was a neat piece of design, elevated by its superb bright green OLED display which was less common then than now. Measuring 87x207x314mm and weighing in at 4.3kg it was agreeably compact, and this further heightened its charm. Here was a little box that was beautifully built and finished, yet packed a lot of features. What was not to like? Of course, it made complete sense to equip the DAC-V1 with a volume control because it negates the need for an additional preamplifier unit. To this function you can add a long list of others – the digitally controlled CMOS analogue volume control also works the front panel headphone socket, complete with its discrete transistor, single-ended full Class A amplifier section behind. The row of smooth acting, backlit buttons on the fascia make switching between its five digital inputs and USB a breeze. The display gives textual and graphical feedback on performance, including a BitPerfect test which tells you if the audio files streamed from your computer arrive at the DAC-V1 unmodified. Press the input button currently in use for a few seconds and a little screen pops up with all sorts of handy system information, such as buffer capacity, file resolution, etc. Inside, a Burr Brown PCM1791A 24bit/748kHz stereo voltage output DAC chip (also seen inside the NDX and SuperUniti) is fitted, with custom digital filtering and Naim-authored code, giving sixteen times oversampling done on a SHARC ADSP21489 DSP along with a RAM buffer. After this the analogue signal goes to a discrete Naim preamplifier gain stage using selected passive components. It works up to 24-bit, 384kHz resolution via USB, with the DAC-V1 providing the clock lock, and there’s no reliance on the 5V line from the USB and its entry into the product ends at the connector; this stops the computer’s power supply noise entering. The conventional digital inputs (1x BNC, 2x RCA, 2x TOSLINK) work up to 24/192. Galvanic (optical) isolation is used between digital and analogue sections, and there’s a linear power supply with 210VA transformer and three separate windings for the digital, DAC and analogue stages. Multiple pre-regulated linear power supplies are used, with discrete audiophile film capacitors in the signal path and discrete tantalum capacitors in critical power supply stages. As ever with Naim, the DAC-V1 has a distinct sound – a certain way that it goes about making music that’s consistent from product to product. This is pure twenty first century Naim of course, which means it’s clean, tidy and smooth with a slightly dark, velvety tonality (something you couldn’t say of products from this company a generation earlier). As ever it is grippy, rhythmic and dynamic too. Bass drum is carried in a taut and punchy way while snares are penetrating yet not harsh, and hi-hat cymbals are crisp and detailed. This unit is highly adept at communicating the dynamic accenting of the players, making for a wonderfully lucid listen. Possibly a little more transparent than its partnering NAP 100 power amp, the DAC-V1 seems quite a smoothie and doesn’t have the ultra vivid top end that the original Naim DAC sports. It also gives a fine sense of space. This converter is detailed enough to let the original recording push out into your room in proper proportion, yet easy enough to never stifle it. The DAC- serves up a large soundstage, inside which all the strands in the mix are located with consummate precision; its rock-solid bassline is an obvious entry point but then you just want to keep on listening. 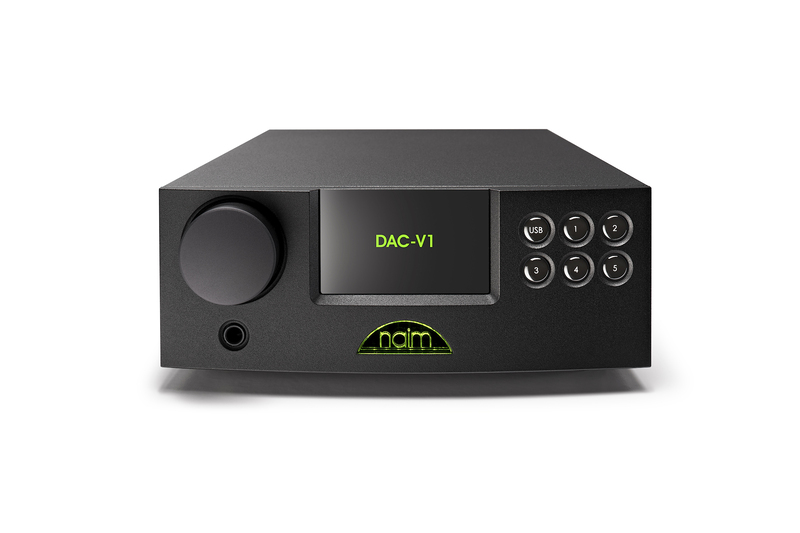 The DAC-V1 is the only DAC/preamp in this smaller form factor in the Naim range and the company’s only asynchronous USB DAC so far. It seemed like a bold product when launched but made a lot of sense, as many people weren’t quite ready for streaming high resolution audio yet still did want to play it via their computer. Paired up with the equally petite NAP 100 power amplifier, it’s a remarkably easy-to-use and accessible package that gives surprisingly good sound on a budget.